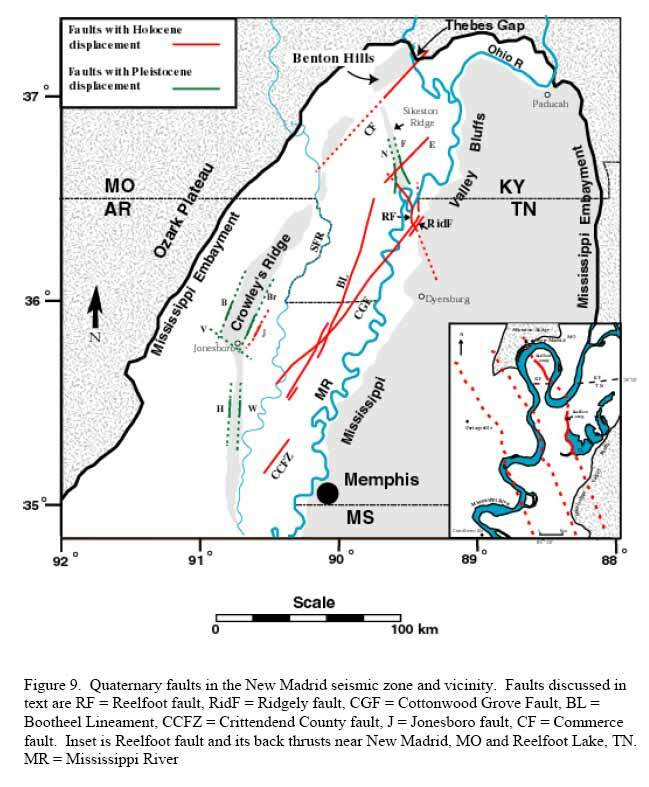 The Commerce geophysical lineament is a latecomer to the New Madrid Seismic hubbub. Researchers examining satellite pictures found some magnetic oddities in a nearly straight line from Terre Haute, IN to central Arkansas. They took soil core samples which gave wildly inconsistent readings. So, they hired front loader operators to dig 14-foot trenches into the hillsides. In the 1990s, geologists from 30-plus countries donned chigger repellant and studied the walls of trenches in the hill near Commerce, MO. They were fascinated. Normal evolution would layer one type of soil on top of another. Not so, here. There were plenty of signs of big earthquake upheaval. They found several kinds of topsoil blown in during different eras, including Ohio river bottom gravel, and even some ancient ocean bottom soil (Mississippi Embayment) that was as green as the nearby leaves. Several kinds of topsoil were within feet or inches of each other. A simpler map of SE Missouri before draining the swamp. Loess (pronounced "luss") refers to deposits of silt laid down by wind action, perhaps during thawing after a glacier retreated. Above: Mississippi River drained through "western lowlands" during first part of ice age, then broke through to eastern lowlands for latter. Only 10,000 years ago it broke through the Thebes gap (see CRU sections on map), toward Cairo IL. Same angle: The top red line below, nearest "Benton Hills" is Commerce Lineament. 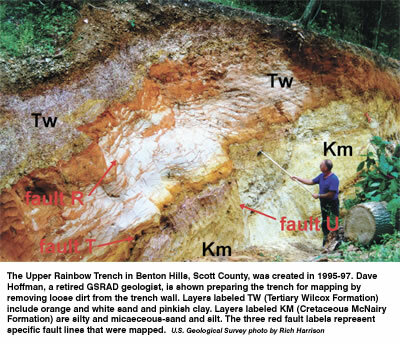 It is parallel to red line below it labeled CGF (Cottonwood Grove Fault), part of New Madrid zone. The Peoria Loess is nine- to 25-thousand years old. It is vertically separated by a three-quarter inch strip from some Mounds gravel (rounded, brown creek gravel), which geologists insist is 2.8 to 24 million years old. And the creek gravel was washed in by the Ohio River (even though it's now up on a hill near the Mississippi River, and the Ohio River is 20 airline miles away). In the same hill, a few inches or feet away, also is Roxana Loess, 30- to 55-thousand years old, and Sangamon Geosoil, 75- to 200-thousand years old. It's easy to differentiate them by the look and feel. Only an earthquake could have acted like a gigantic blender to mix these soils. This information comes from someone who assisted researchers, showed us the trenches and papers with findings. Fine sand, both red and white, the kind you would find on a seashore, is also just a few feet away. (At one time, a shallow finger of the Gulf of Mexico called the Mississippi embayment extended to this area. Several yards farther down the ravine researchers found some definitely green soil, that research showed to be from the bottom of a sea, 60 million years ago. Some of the Peoria Loess has clear, sharp upheavals in it. This is a sign of "new" seismic activity here, less than 10,000 years old. Some of this area's quakes were millions of years ago, some thousands of years ago, and a September 26, 1990 magnitude 4.6 quake (centered at New Hamburg, a few miles away) where a resident at the foot of this hill heard three loud "booms" and had difficulty standing on his concrete steps for many seconds until they stopped shaking beneath his feet. The Commerce lineament map shows the lineament that goes almost exactly under the road from Commerce to Benton, then to Idalia (Holly Ridge, near Bloomfield and Dexter), and south of Poplar Bluff near Quilin, into Arkansas. Excavations at Idalia and Quilin, and Thebes, IL (just across the Mississippi) all show similar upheavals and mixing of widely different soils. 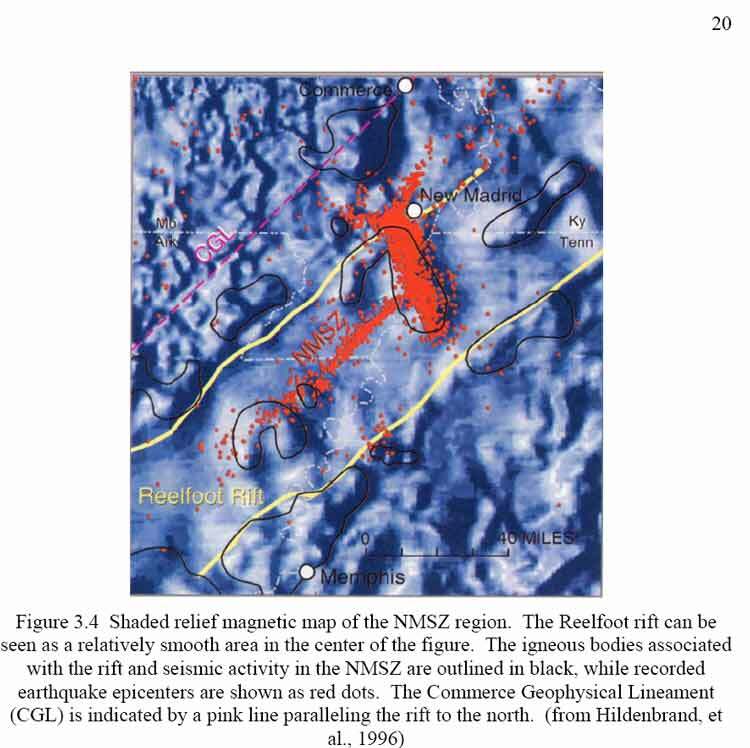 Researchers at one point carried sensors on sticks, wired to a truck, that did x-ray type mapping of a large crack in the bedrock generally underneath the Benton to Commerce road. Just south of Cape Girardeau (at its airport) is a perfectly flat area wide enough to be an old river bed. It was. Here, until perhaps twelve-thousand years ago, the Mississippi River took a sharp right turn, and spilled out across most of the Bootheel. The obstacle forcing the right turn was a line of rocky hills (Crowley's Ridge) that extended from Arkansas, and connected with other hills at Thebes, IL. What broke the "Thebes Gap" and let the Mississippi make its way past the present little town of Commerce and on to Cairo, IL? It was probably a combination of natural evolution and a big quake or two, perhaps directly on the Commerce Lineament. When the Mississippi is low at Thebes, the cracks in the rocks have a consistent direction that seems to match the theory of a big shake in the Commerce Geophysical Lineament. 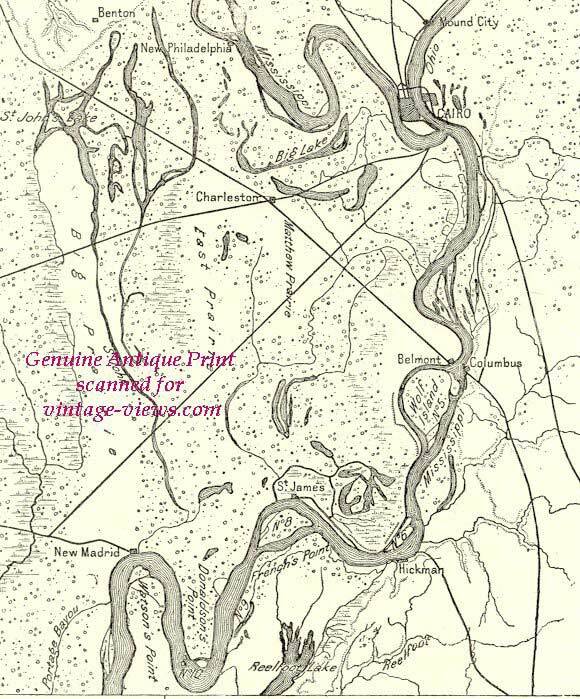 We find it fascinating that the big "Benton Hill", part of the "English Hills" midway between Cape Girardeau and Sikeston, once was the north bank of the OHIO river. 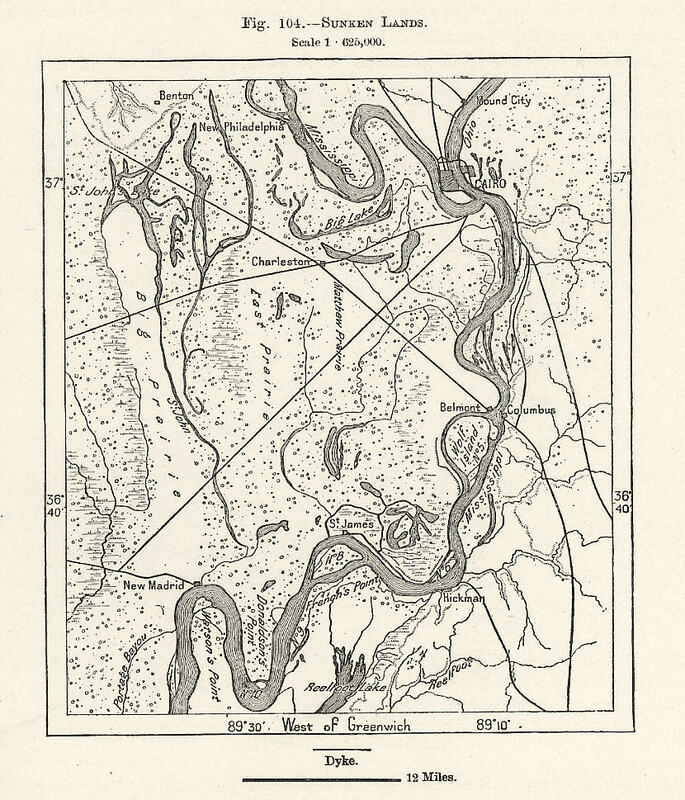 The Ohio came across the present Cache River basin near Ullin, IL, then south of Olive Branch, to the east side of Crowley's Ridge, north of Sikeston, MO. Something rerouted it, as well, just over 10,000 years ago. The waters didn't fully join until Helena, AR, more than 200 miles further south, even though the Mississippi was flowing along the opposite side of Crowley's Ridge. The hills at Commerce show geological signs of young upheavals (10,000 years or so), because ravines are deep, rugged, and not time weathered. Just a bit to the north, a creek empties into the Mississippi River. In contrast, its bed seems to be well worn, aged over a much longer period of time, and may have once carried much more drainage water than it now does. Earthquakes may be responsible for the changes. We need Carl Sagan to say "billions"
Some speculate the famed New Madrid Fault is only a branch, just like a tree branch, off the Commerce Lineament. So what about the other "branches"? Well, we only have records for the last 200 years, out of the last few billion years. It takes decades for new theories about earthquake causes to gain acceptance. There is evidence that other branches shook, before mankind got around to writing it down. 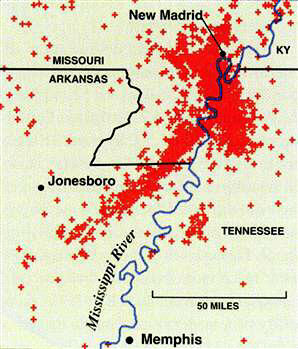 The first quake recorded in the New Madrid region was by a missionary on Christmas day 1699, near present Memphis.